Satyagraha is an Indian Hindi Language Drama Movie, Which is Written by Anjum Rajabali, Prakash Jha Directed by Prakash Jha and Produced by Prakash Jha, Ronnie Screwvala, Siddharth Roy Kapur and the Banner of the picture is Prakash Jha Productions, UTV Motion Pictures ,while Salim-Sulaiman, Indian Ocean, Meet Bros Anjjan, Aadesh Shrivastava scored Music for this Movie. Coming about the Cast & Crew of the Movie is Amitabh Bachchan, Ajay Devgn, Kareena Kapoor, Arjun Rampal, Amrita Rao, Manoj Bajpai .while Sachin Krishna took Charges of the flim Cinematrography and Editting of the Movie is Santosh Mandal . 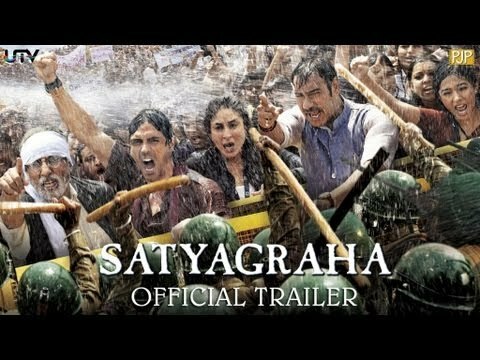 Satyagraha Movie Released on 30 Aug 2013.